G Floor is made in USA and has a limited lifetime manufacturer warranty. A solid vinyl floor covering that comes in many patterns and sizes, allowing you to cover wall to wall or just small areas. Available Widths 5', 7.5', 8.5', or 10'. Stocked sizes ship 1-3 bus. days and custom cut lengths ship 3-5 bus. days. Lead Times do not include transit time. Coin 75 Mil available in Midnight Black, Slate Gray, or Sandstone Tan. Coin 60 Mil is available in Midnight Black or Slate Gray. The G Floor Vinyl Flooring in Coin Pattern & Small Coin Pattern is made of high-quality virgin polyvinyl material with an attractive design of raised circles. Roll out flooring is the easiest way to cover any space, beautify any space in just minutes. Available in many sizes and colors, this is sure to be a perfect product for any one and nearly any application. Pricing includes free shipping! 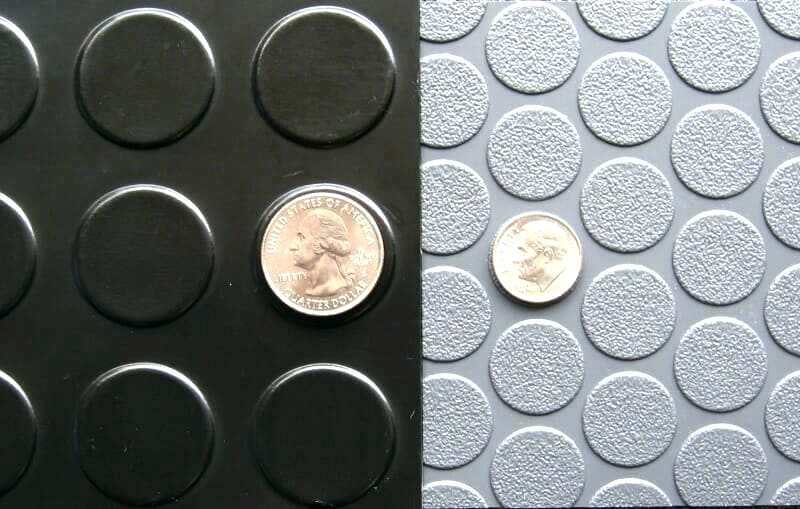 Coin Pattern 75 Mil: The circles measure 1.25” in diameter, spaced 0.25” apart. The Coin 75 Mil is available in three colors: Midnight Black, Slate Grey and Sandstone Tan. Stock sizes: 5’ x 10’, 7.5’ x 17, 8.5’ x 22’, 8.5’ x 24’, and 10’ x 24.’ Custom Cut mats are available in 7.5’, 8.5’, 10’ width x lengths from 10’-100.’ All stock sizes ship within 1 to 3 business days. We also have custom cut sizes, which ship within 3 to 5 business days. Please note lead time does not include transit time. Small Coin Textured 60 Mil: The circles measure 0.75” in diameter and spaced 0.125” apart. The Small Coin 60 Mil is available in Midnight Black and Slate Grey. Stock sizes available: 5’ x 10’, 7.5’ x 17, 8.5’ x 22’, 8.5’ x 24’, and 10’ x 24.’ Custom Cut mats available: 7.5’, 8.5’, or 10’ width x lengths from 10’-100.’ Please note lead time does not include transit time. Popular Applications: Both the Coin 75 mil and Small Coin 60 Mil durable and flexible, these flooring mats are ideal for any flooring need you might have. They work well for garages, basements, trailers, workshops, home gyms, mudrooms and more. They can even be used outdoors, though as a warning to customers, this product is not UV stable and fading may occur. The vinyl flooring is slip-resistant and provides cushioned comfort for walking and working. G Floor Roll Out Flooring Benefits: G Floor Roll Out Flooring is easy to install, requires no expert labor, no adhesive in most cases, no messy chemicals before or during installation, and can be walked or driven on almost immediately after being put down. G Floor flooring mats are comprised of sturdy virgin polyvinyl material that features a non-porous surface that is a simple to clean (most spills can be cleaned with soap and water) and lasts for years. G Floor Vinyl Flooring is resistant to oil, antifreeze, salt, mud and many other common garage contaminates, protecting your floors from damage. This product is not stain proof however, so you should make sure to clean up any spills as soon as possible. The great thing about this product is that you can cover the entire garage floor or you can just create parking spots, workout areas, workshop areas, or more! Hide old, stained, cracked concrete with G Floor Roll Out Flooring in just minutes for an affordable price. G Floor Roll Out Garage Flooring product does carry a limited lifetime manufacturer warranty. G Floor is manufactured by Better Life Technologies and is Made in The United States.